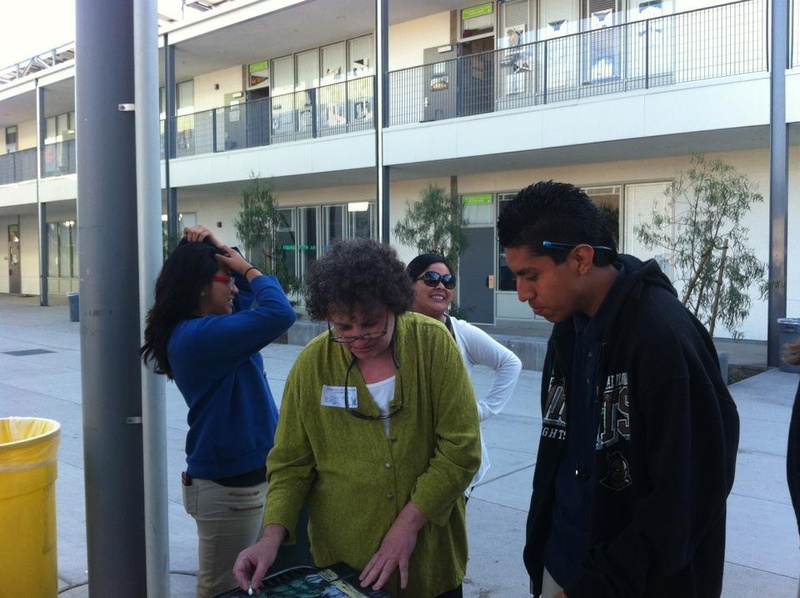 This is the third and final post, showing my time in Venice Beach, California. My husband and I stayed in a rental house (really more a cottage) on Flower Avenue, during our week in this west Los Angeles neighborhood. We did all our own cooking (Whole Foods Market and year round farmers markets close by). 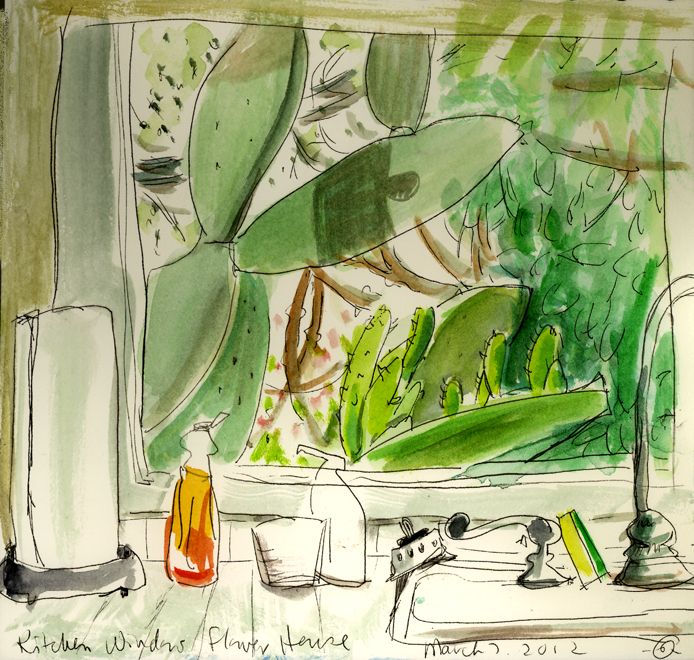 So I stood at this kitchen sink window everyday, looking at this huge cactus and the backyard. "Kitchen Window Flower House", watercolor and ink, 7"X7"
We rode the bike trail, that borders the expansive white sand beach, from Venice to Santa Monica, the adjoining seaside community. 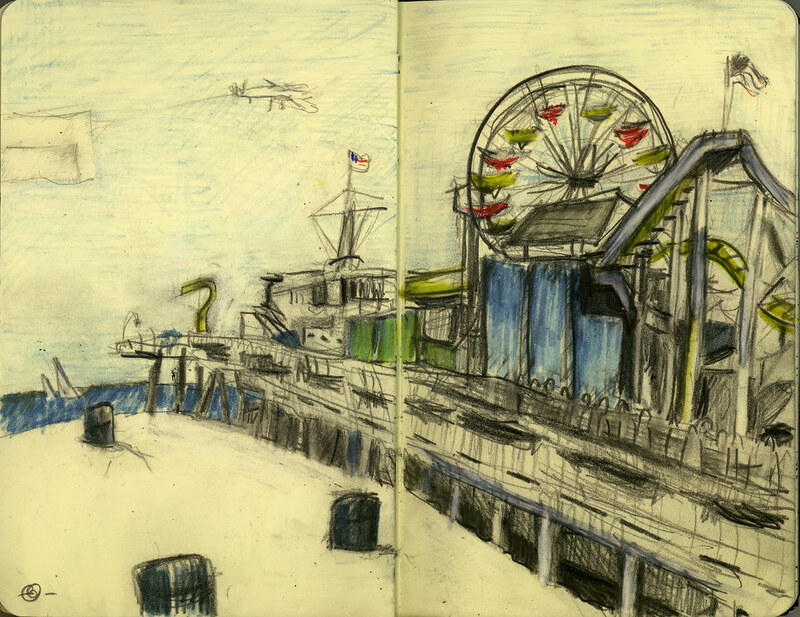 On a previous trip, last September, I sketched the Santa Monica Pier, an old time amusement park. This time, from the same spot, but all I could muster was this snippet. I guess I was played out after doing over 20 drawings during the two weeks in California. I was ready to go home. 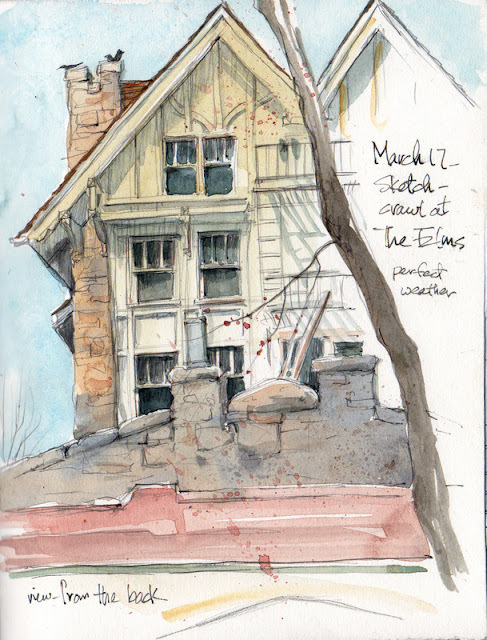 Packed and soon to leave for the airport, I did a final quick one of the house diagonally across the street. Midweek of my weeklong winter getaway in Venice Beach, California, I pedaled off on my rented bike to capture the swaying palm trees that tower above the rooftops of this beachside Los Angeles community. Coming from the Midwest where trees are prized for their shade, I wondered what these trees offered, since they are too high to supply much of that. 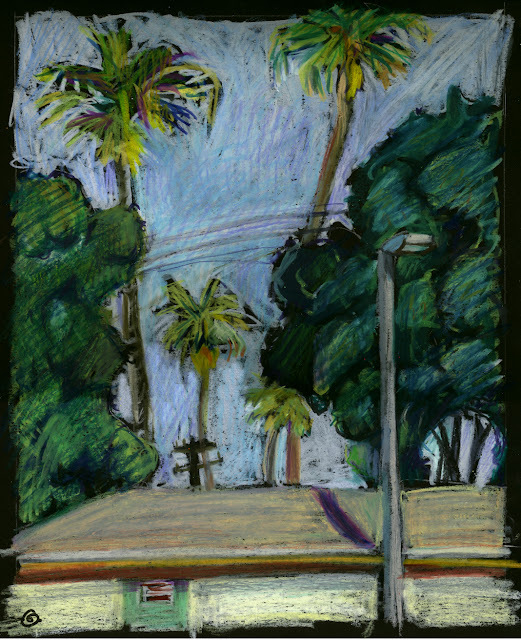 I drew from the boulevard on my folding stool, loving their wild tossing silhouettes against the sky and the rustling, swishing sound of the fronds being moved by the wind. 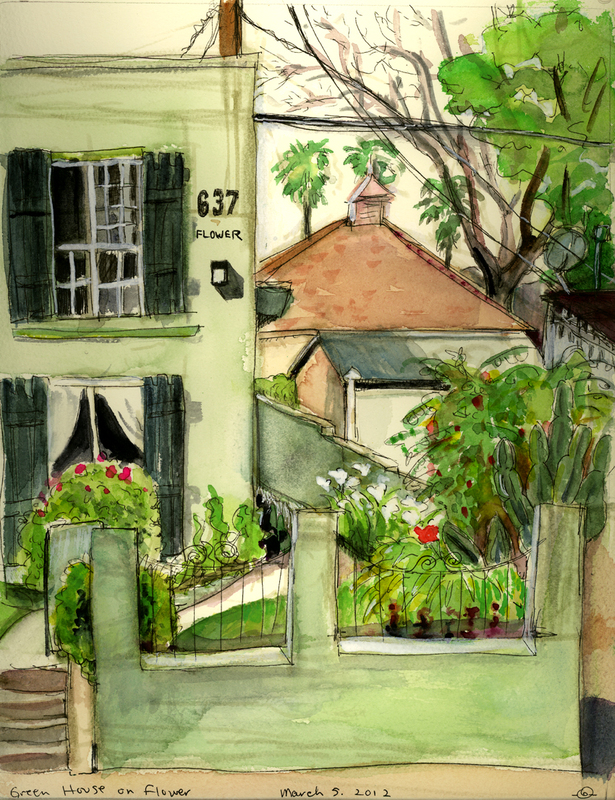 Across from our rental house on Flower Avenue was a lovely, pale green stucco apartment building with a beautifully tended garden. I enjoyed sitting out on the front stoop--perfect temperature and no mosquitos. One of my fellow Urban Sketchers, Stephanie Lowe, teaches art at Animo Charter High School in Venice Beach. Stephanie and I met in Portland at the first Urban Sketching Symposium in 2010 and then we both attended the 2nd Symposium in Lisbon in 2011. 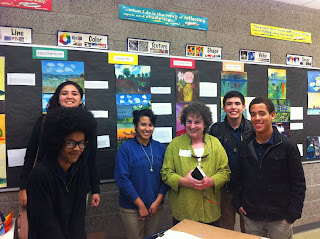 Having taught drawing at the elementary and college levels years ago, I was excited by her invitation to visit her classroom as a guest artist and share my excitement about sketching with a younger generation. I met with two groups of students: a regular drawing and painting class and then an after school group--the newly formed Animo Urban Sketchers. 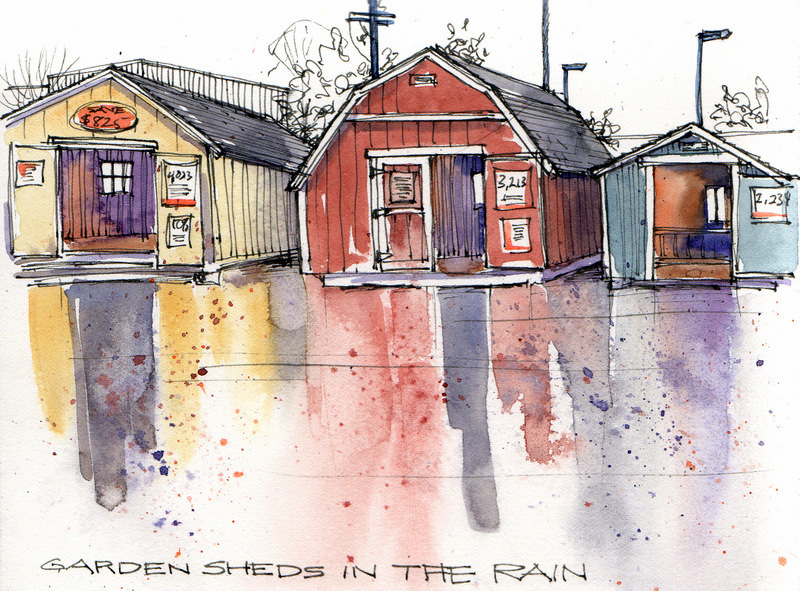 I showed them some of my sketchbooks (mostly drawings from this California trip) and I drew alongside them. The kids were great and interested! I enjoyed seeing what they'd done in Stephanie's class and in their sketchbooks. I talked to the kids about how I sometimes use windows in drawings, how it helps to zero in on what to put in a composition and to define foreground and distance. 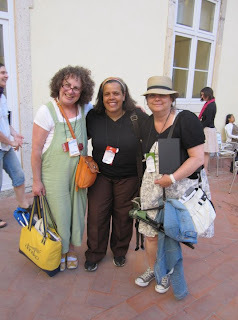 We drew together in the school courtyard. Here's what I did with the kids watching over my shoulder. My "window" was the opening to the sky created by the horizontal of the rooftop and the darker green trees on either side. Kids wanted to know what I was going to draw next. They gave me their recommendations, which is why I went to the beach and Venice Skateboard Park on my last day before flying home to Iowa. These will be in my next and last installment of Venice Beach: An Iowan Explores a Corner of the LA Metropolis. As a getaway from winter, my husband and I spent two weeks in Southern California, in late February and early March. 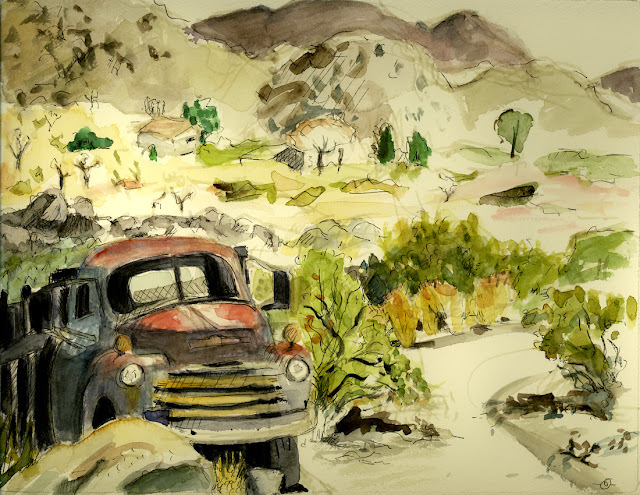 The first week was in Joshua Tree. See my 3 posts showing my view of the Mojave Desert by starting here. Our GPS predicted 2-1/2 hours to drive to our rental house in Venice Beach, a charming beachfront district of Los Angeles. It took closer to 5 hours--the extra logged on the abysmally backed up freeways closer to LA proper. We're wimps when it comes to traffic: once we finally made it, we vowed not to use the car until we drove to the LAX airport to go home. 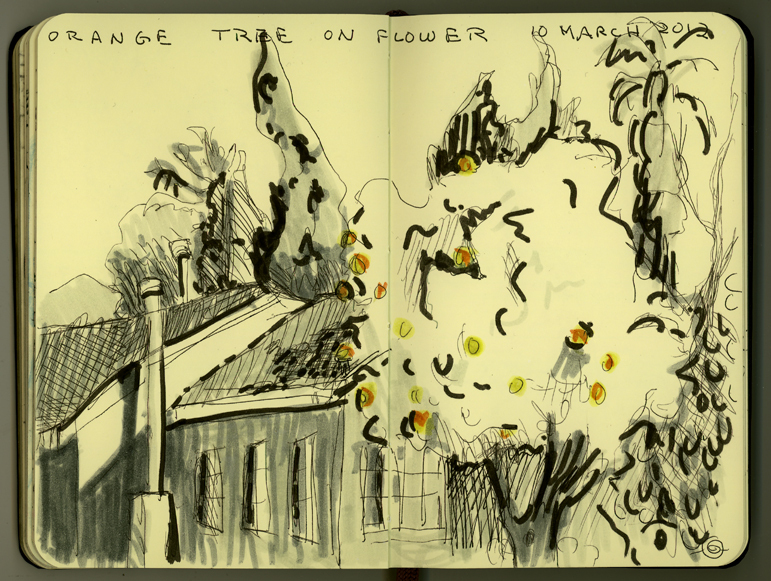 Okay by me, I had a great week walking, biking, drawing, and basking in the SoCal sunshine. 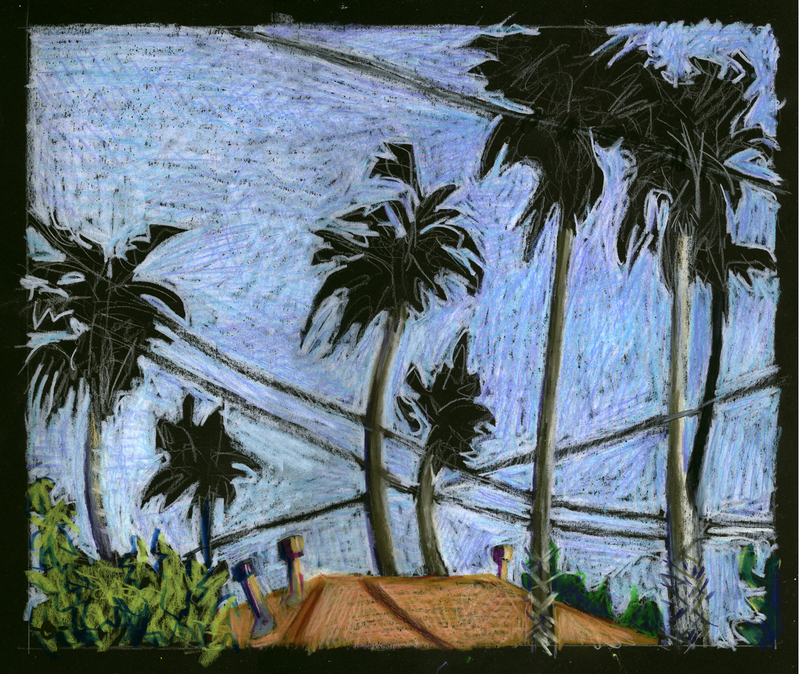 "Palm Trees", ubiquitous with Venice Beach. These drawn quickly, soon after we arrived, with watercolor and ink in a new square format sketchbook (7"x7") that I really like. Venice Beach has a charming neighborhood of walk streets. Mostly small Craftsmen-style houses front onto narrow pedestrian lanes. Our first full day, I made a beeline for a spot on Marco Place with amber glass globes hung from trees in someone's front yard, one dangling above the public walkway, that I had discovered on an earlier visit to VB. I'd rented a bike for the week. The wheels of choice in VB are beach cruisers: wide tired, one-speed, brakes in the pedals, and in bright colors. It made me happy that mine had pink rims. Here's my set-up, when I got up to stretch my legs. Hard to believe this is less the a block from the busy Highway 1 that spans much of the California coast. 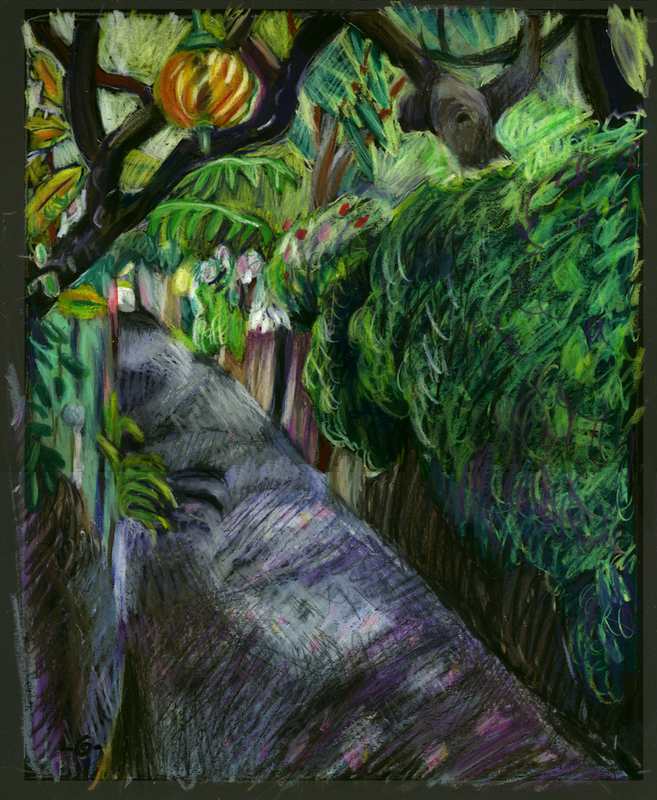 With the drawing in progress, a closer look with my trusty folding stool and boxes of NeoColor II wax pastels. The boxes are cedar Jamaican cigar boxes I inherited from my father. I did this watercolor September 2011 in a bound sketchbook (5.25"Wx16.5"H), when I last was in Venice Beach. 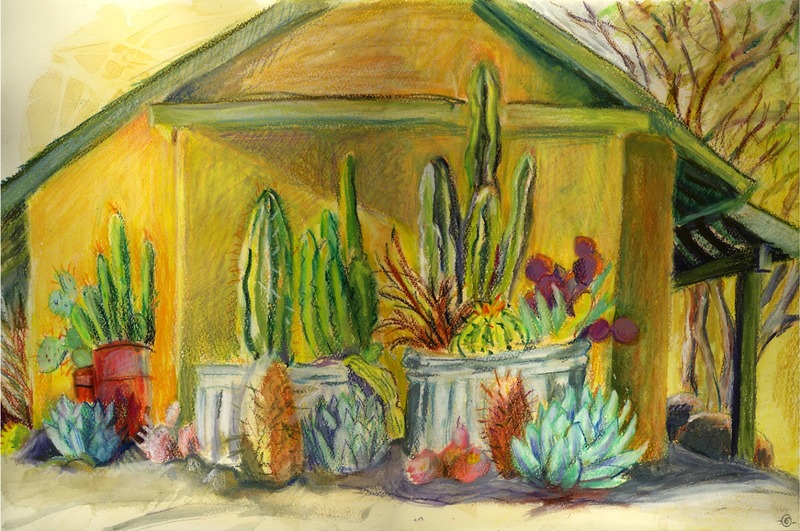 "Venice Beach Garden" is of a rental cottage's courtyard garden, also on Marco Place, very close to where I drew the NeoColor II above. 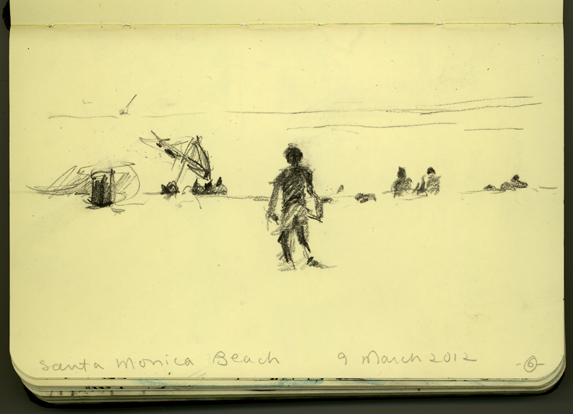 This will be the first of three posts, showing my exploration of Venice Beach. Stay tuned. I waited while Joseph went in to get more cutting board countertop for the house we're rehabbing...it was a lovely rainy day. I added the wet reflections at home! I'd MUCH rather sketch than shop! 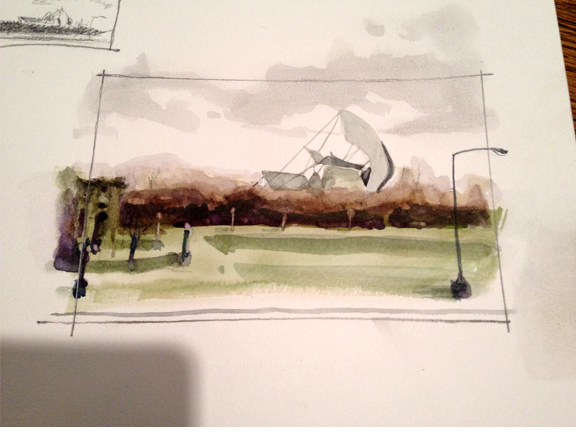 As you may have seen previously, Kate got a couple of photos while I was working on this sketch. 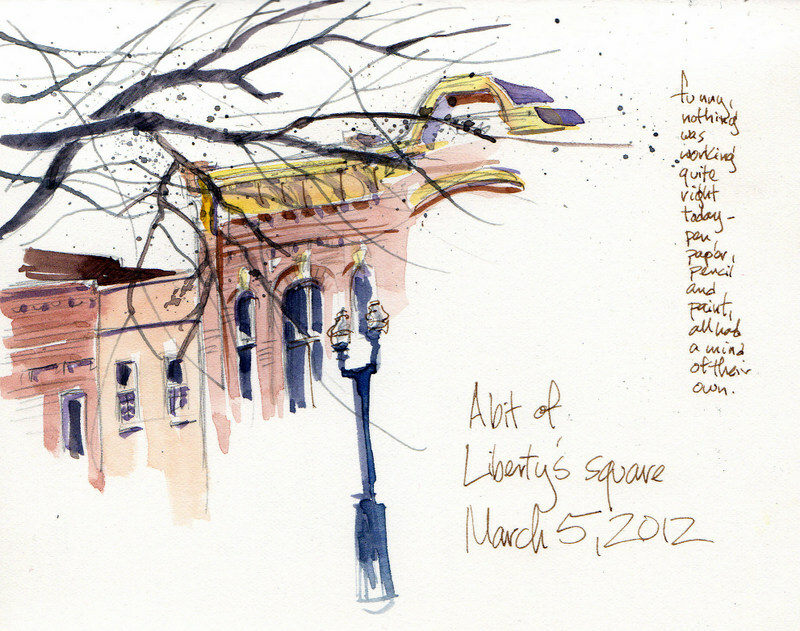 It was an absolutely beautiful day to be outside and it was great to be able to tour and sketch this historic place. 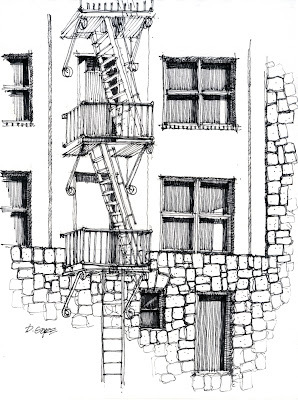 For some reason the fire escape at the back of the hotel caught my eye and provided an interesting rhythm of shapes moving up the side of the building. I am humbled by the talent of this group and feel blessed to be able to show my work alongside so many gifted and talented individuals. This sketch is the first thing I have done in several weeks. It was good to get back at it! Hope you enjoy and thanks to Kate for making these outings possible! Junk and making creative use of junk seem part of High Desert culture around Joshua Tree, California, where my husband and I spent a week earlier in March. At the rental house, a rusted out Chevy pickup, permanently marooned in the driveway, served as a firewood bin. 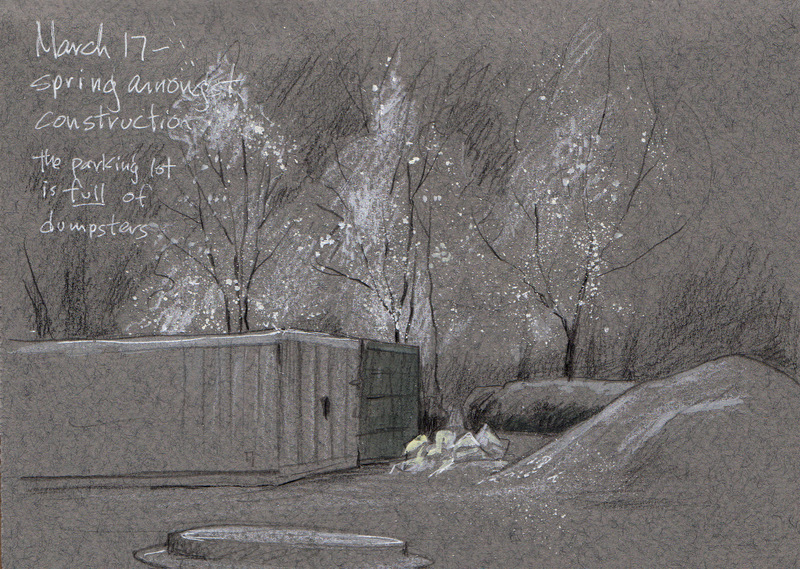 Our initial days were cool, but finally warmed so drawing outside was comfortable. 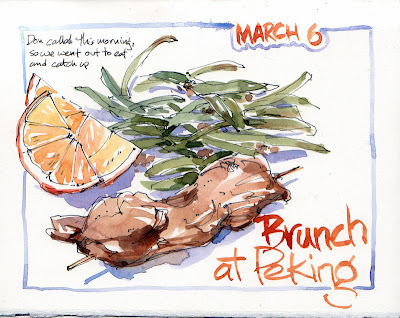 Often when doing a watercolor, I first sketch with a warm grey Faber-Castell PITT artist pen, which is permanent Indian ink. Rusted Out Chevy scanned once home. A cactus garden, using cattle troughs and old red oil drums, was along the driveway-facing side of the house. So much fun to get messy with my Neocolor crayons! My last drawing before leaving the desert was in the guestbook. 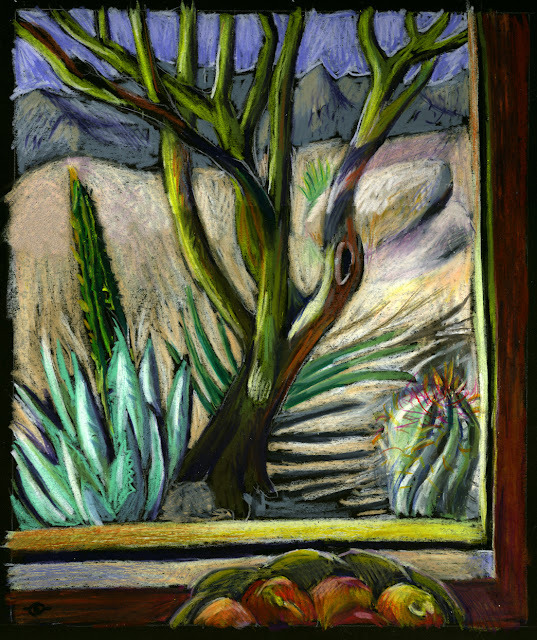 A quick ink sketch--a view from inside with cactus close to the house, rocks in the mid-distance, and mountains beyond. Hope he adds his sketch soon! Malinda and kidlets worked inside the big gazebo...she had a new high-tech toy she was sketching on! 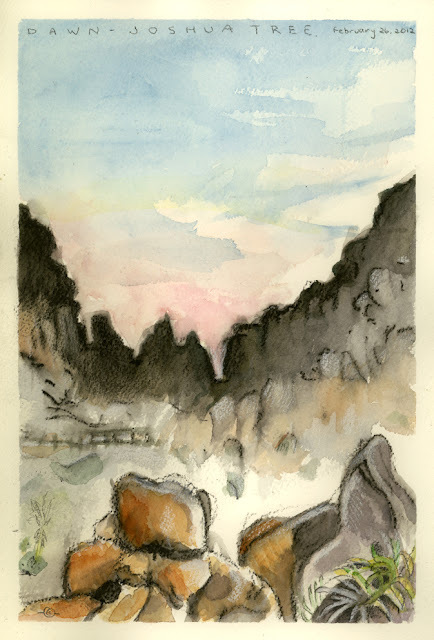 The morning of the first full day of our week long stay in Joshua Tree, I woke to dawn, framed by the silhouetted, jagged, boulder ridge, across the dry wash from our rental house. Affected by the change of altitude (3,800 ft above sea-level to Iowa's 810 ft), I slept poorly for the entire stay. The vastness and predominance of earth-tones of this stark landscape is awe-inspiring and daunting to my green-hungry, Midwesterner eyes. Drawn from inside on Fabriano coldpress watercolor block with soluble 9B graphite stick, watercolor, and white Derwent colored pencil (7"W x 10"W). February 26, 2012. Me on a hike on the other side of the ridge, pictured in the drawing above. We saw lots of wildlife, both from the house and on hikes. 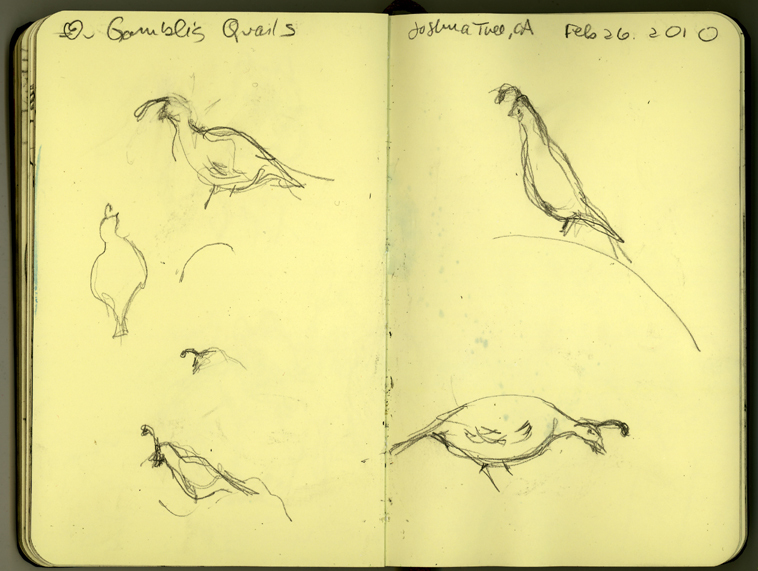 Gambel’s Quail skittered around within view of our windows. A bobcat slunk by everyday and peered in at us. We saw coyote, jackrabbits, and kangaroo rats. On one hike, I came upon a paw print of a mountain lion in fresh mud. My husband crossed paths with a fox carrying a freshly killed rabbit in its maw. But the only record, either drawn or photographed, of fauna was this quick 5B pencil sketch in my carry-everywhere, pocket-size Moleskine. 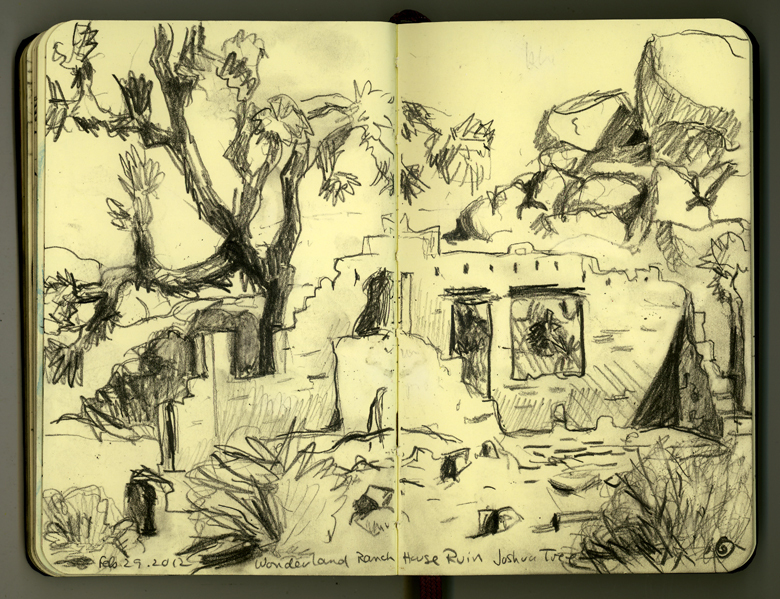 This ends the second installment of my Joshua Tree adventure and set of drawings. Still more to come from the High Desert. Then onto what I drew the following week while staying in Venice Beach, a quaint corner of the Los Angeles metropolis. My husband and I had visited Joshua Tree National Park two years ago. Again for a week, we stayed near the northern part of the park, which is the southern Mojave High Desert. On the first trip we did lots of hiking; I took photographs, but did no drawing. I've been yearning to return. This time I drew. Our rental house was surrounded by a jumble of rocks. Their forms are endlessly amazing. 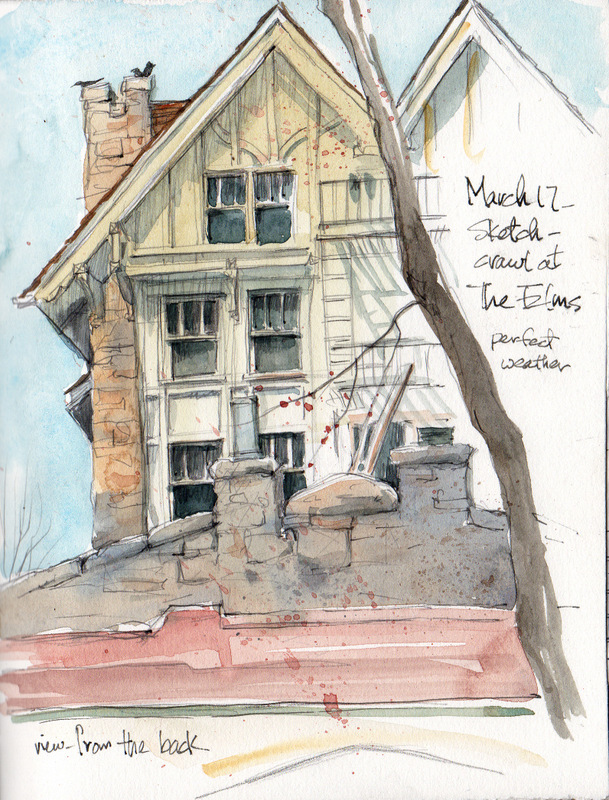 Late in the afternoon, I drew from inside the house. It was cold (40F-50F) the first several days. Also, I was feeling the affects of the higher elevation. The older I get, the more sensitive I have become to changes in altitude (~3,800 feet compared to Iowa's 810 feet). 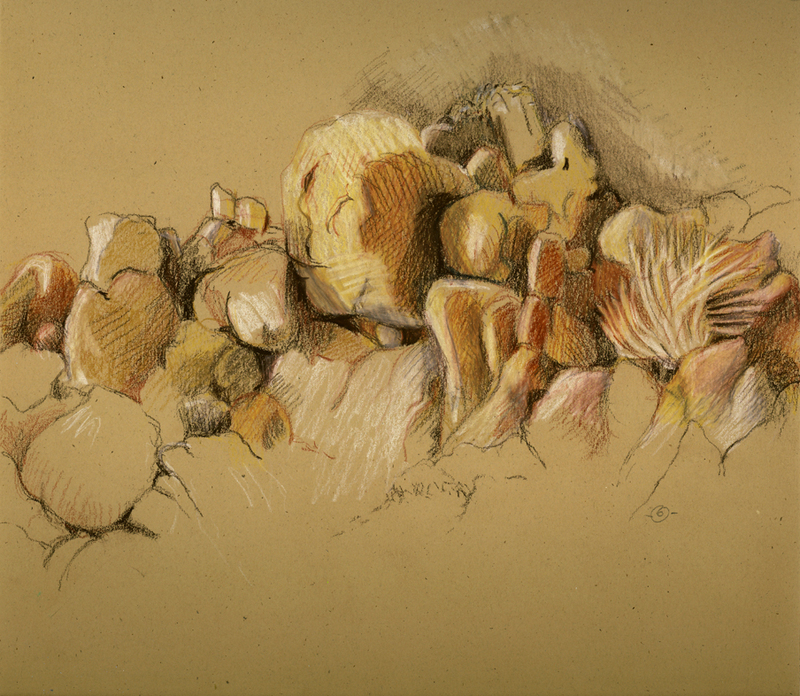 The drawing above was done in a Canson, sand-colored, archival sketchbook (9" W x 8" H), using Derwent earth-tone colored pencils that I had acquired especially for the trip. The photograph below, which included the house, shows the larger landscape. 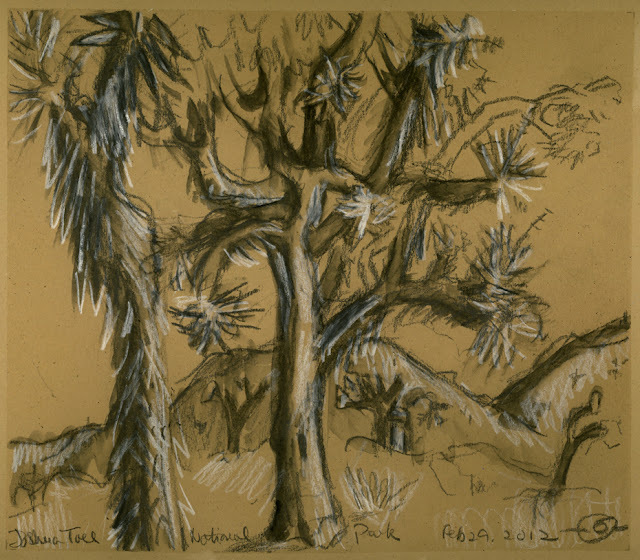 Joshua Trees are another distinctive feature of the landscape. They are a form of yucca. They remind me of something from a Dr. Seuss storybook! This is the time of year that the Joshua Trees flower. If they do flower, which is not every year and dependent on rainfall. The average annual rainfall in the Mojave Desert is 4.5 inches (compared to Iowa's 33 inches!). There has been even less rain than usual, so unlike our previous visit, we saw few of the large gaudy, white flowers at the ends of the limbs. I drew this in the Park from the protection of the car--again, too cold and also windy. 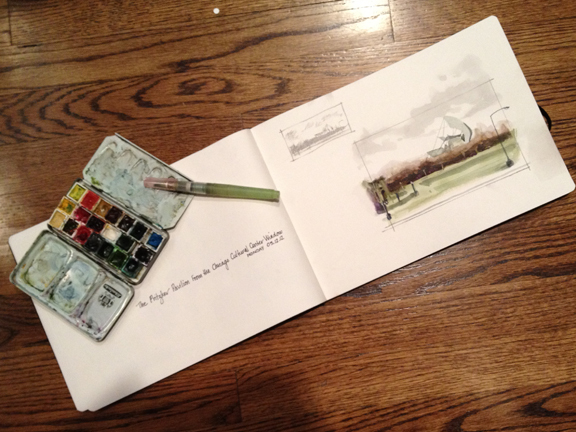 The same Canson, sand-colored, archival sketchbook (9" W x 8" H), this time using a 9B water soluble graphite stick and a white, Derwent colored pencil. There was fabulous landscaping close-in to the house--plants requiring some, but minimal watering. From the kitchen window, in the morning, looking west, the sun coming up over the roof of the house illuminated this paloverde tree. The zingy, green bark against the blue sky and the distant mountain grabbed my attention. It also was an opportunity to add to my inside-outside series. I used my Neocolor II water soluble wax pastels in a Canson, black, archival sketchbook (10" W x 12"H). This is the first installment of my Joshua Tree adventure and set of drawings. More to come from the High Desert. 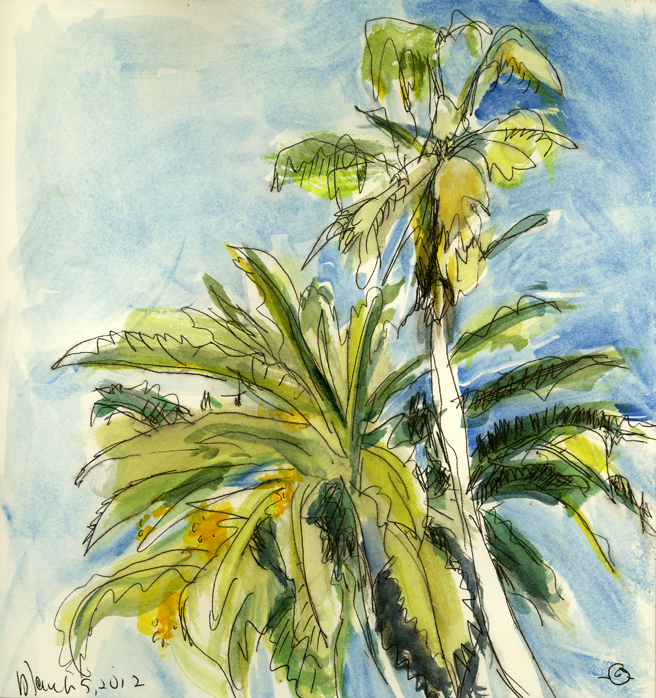 Then, I'll show you what I drew while in Venice Beach, a quaint corner of the Los Angeles metropolis, for the second week away from Iowa winter. Ruth St. Dennis, a photo by Cathy (Kate) Johnson on Flickr. 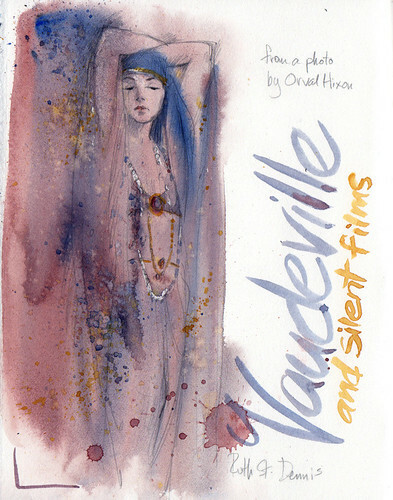 And it looks like the photographer and I BOTH spelled her name wrong...it's Ruth S. Denis, one N. Quite the famous lady in her day, it appears--she was inducted into the National Museum of Dance C.V. Whitney Hall of Fame in 1987. Does she fit here? I don't know...I sketched her on the spot, in an urban setting, but she wasn't moving much! 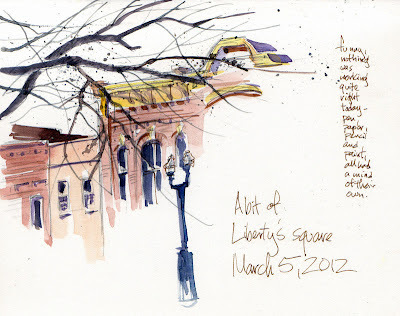 Last Monday our local sketch group met at the Chicago Cultural Center. 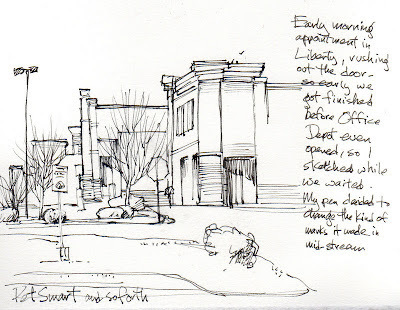 We had a brief discussion about upcoming venues and then headed off in different directions to sketch. It was one of those Chicago days that was lovely one minute, iffy the next and then back to lovely. I chose to stay inside and sketch just in case. This was done from a second floor (maybe it was the third floor) window. Looking east, toward the lake, the Pritzker Pavilion looks like it's in full sail. 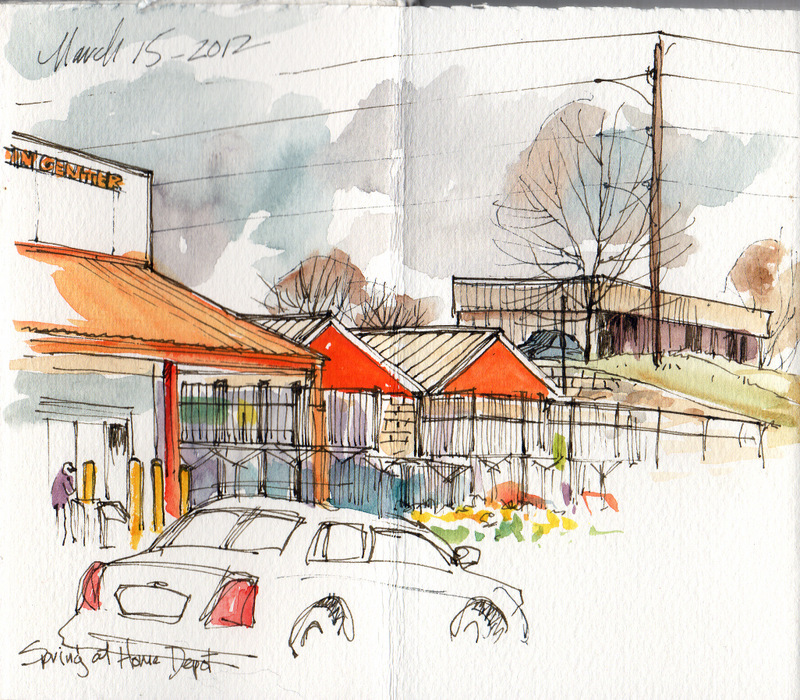 I sketched at the window and then added color when we regrouped in the CCC lobby. The first two images are from my iPhone. 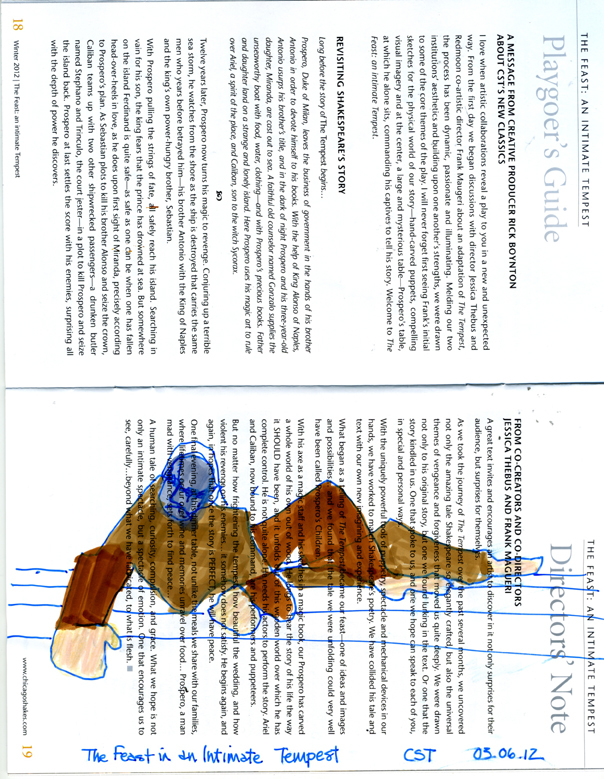 The third one is scanned and seamed in Photoshop. Going to the Chicago Shakespeare Theater is always a remarkable experience. Last night we went to see "The Feast: an intimate Tempest". It's an adaptation of Shakespeare's "The Tempest" and a collaboration of CST and Redmoon . Done in the small theater, it had everything, fantastic set, illusions, puppets and of course acting! I usually don't draw at the theater but we were seated in the last row and the whole atmosphere was so creative I gave it a go. It was really dark! 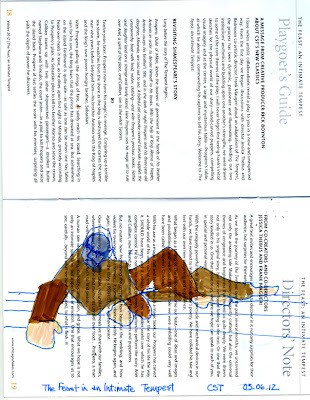 When the lights came up I added a few lines to my sketch of Caliban for clarity and added the colored marker at home. And today a friend called and asked if we wanted to do lunch. Um, YEAH!